Japanese student sporting an all pink kawaii street style while out and about in Harajuku. Tokyo students in strawberry-themed street fashion while out in Harajuku. Japanese student wearing a pink satin dress and white platform wedge shoes in Harajuku. Well-known Tokyo street style personality A-Pon wearing plaid fashion in Harajuku. 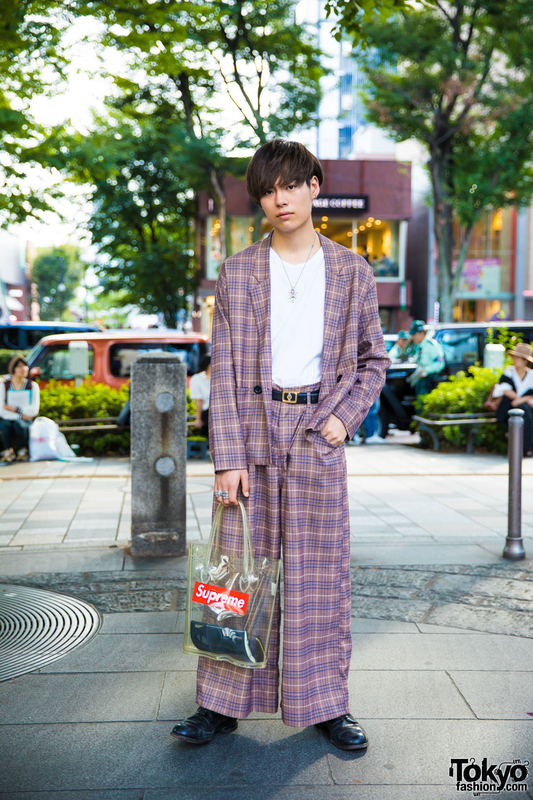 Harajuku guy in vintage street style with plaid coat and wide leg pants, white t-shirt, black belt, vintage leather shoes, Supreme Comme Des Garcons bag, and Chrome Hearts accessories. Harajuku girl wearing a plaid top by Burberry with vintage acid wash jeans, Nike sneakers, and a UNIF rainbow backpack. Japanese high school students wearing plaid tops with items from Nadia Harajuku, Faith Tokyo, Oh Pearl, and X-Girl. Harajuku girl in twin braids sporting trendy street style width high waisted jeans and gingham off-the-shoulder top.